By default, the tool will have your main company in the company selector, and the date range set to the past 30 days. You can change these settings with the blue “Company” drop down and the calendar at the top of the reports in this tool. The Company selector in the Overview will let you pick a single company to focus on. If you open a deeper report, like Facebook Posts or Twitter Tweets, you are able to select “All profiles” to compare data from all of the companies in your project. Adjusting the date range with the calendar drop will customize the time range for data in all of the reports in the tool. For example, if you want to analyze activity on a single day from the beginning of your campaign, open the calendar and select the specific day. Or, if you want to see activity over a four month period, enter the first and last date of the custom period in the calendar drop down. The limit to this feature is that you can only view data dating back sixty days before the date that your project began. So if you created a new Social Media Tracker campaign on August 31st of 2016, you would be able to see data from July 1st, 2016. Another great feature in the calendar is the Custom Comparison. When you hit the custom comparison checkbox in the calendar, it gives you the ability to compare two custom, non-sequential date ranges. For example, you could compare the entire month of June to the entire month of August (seen below). The red and green arrows indicating change reference the difference between these two custom time ranges. In the example above, we can see that CNN.com’s Twitter account had a higher audience and engagement (green arrows) in August compared to June, despite less activity (red arrow). The top of the Overview will show the select company’s audience size, activity (posting activity) and engagement on each channel. You can sort this graph with the column headers; Audience, Activity, and Engagement. This is an easy way to see where a company has the biggest audience, where they post most frequently and where they see the most engagement. After you select the timeframe that you want to analyze, SEMrush will put a green or red arrow next to a metric that increased or decreased since the previous period. If you select a 7 day period, the metrics will be compared to the total from the week before your time frame. If you select a single day, the metrics will be compared to the day before your selection. Notice above how the arrows in the graph for CNN indicate positive growth in their Twitter, Facebook, and YouTube audiences, but a decrease in Google Plus audience. This was analyzing a 30 day period, so the change indicates a difference from the previous month’s totals. The Top Content section shows your competition’s most engaging posts over the given time frame. You’ll see the top Tweet, Facebook post, YouTube video, and Google Plus update based on engagement. The posts can be sorted (1) by Total Engagement or Engagement Rate. Total Engagement will tell you which post had the biggest overall impact, and Engagement Rate will tell you which post had the biggest impact relative to the size of their audience. From here you can identify which competitor gets the most audience interaction and gather ideas for what to talk about on your own channel. Click on “view all __ posts” (2) to open a Posts report for the corresponding channel. In a Posts report you can see all of the posts that your competitors published over the select time frame. This graph compares you and your competitors on three basic metrics; audience, activity, and engagement. By default it sorts by Total Audience size, but there are multiple ways to manipulate the graph. Change between comparing audience, activity or engagement with the titles at the top left (1). Then choose to sort by the total number, change in this number, or growth % at the top right (2). You can add and remove any of the social networks from this data with the blue and red squares below the graph. This allows you to get specific analysis on a single social network or any combination of 2, 3, 4, or 5 networks together. You can also customize the graph by hiding the metrics for a single company with the eye icons on the left side of the graph. Keep reading! The next chapters of the manual will walk you through the features available to you in the Facebook report and Twitter report. How much historical data can I see in Social Media Tracker? How do I add a competitor if my campaign is already started? How do you measure Engagement Rate in the Social Media Tracker? How do I change a time period? 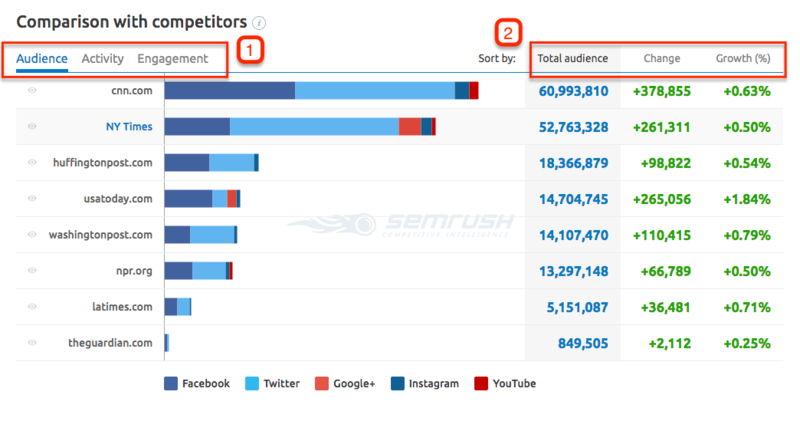 What is the difference between internal social analytics and the SEMrush Social Media Tracker? Does SEMrush take information from my personal social network account?